Thornhill, appears to be just English. The Gaelic form "bàrr na driseig" ​- is just a translation from English into Gaelic. The other main road passing close to Thornhill is the A702 from St John's Town of Dalry, via Moniaive, which when built by-passed the town as Gill Road joining the A76 at the north of the town - there has subsequently been development north of this road. The A702 continues in its own right again from Carronbridge, 2 miles north of Thornhill; crosses via the Dalveen Pass into Clydesdale and joins the M74 near Elvanfoot - the first of the passes through the Lowther Hills between Nithsdale and Clydesdale. Moniaive nestles between Craigdarroch Water and Dalwhat Water shortly before both join the Castlefairn Water resulting in the Cairn Water, flowing down Glencairn - which gives its name to the Parish, and presumably the whisky glass. After the Confluence of Old Water and Cairn Water the river's name changes to Cluden Water, and it flows into the River Nith just north of Dumfries, near the ruins of Lincluden Abbey. Thornhill's nearest Whisky Shop is in Dumfries - TB Watson (aka Drambusters) (16 miles). Nearest distillery - Annandale (31 miles). HQ of Independent Bottler, Creative Whisky Company is in Thornhill. Duncow was home to Glencarrick Distillery between 1831-33, the first OS map (1847) shows it as a ruin, and the OS Name Book has a brief description; Dunscore to Glenisland Distillery (aka Glenessland; Dunscore) between 1826-28, its output in 1828 was 30,491 gallons - 5 times as much as Highland Park that year! The distillery is again shown on the first OS map and is mentioned in an article on Dunscore's website. Auldgirth old bridge, with special built-in cycle-unfriendly feature. Carronbridge, a small village north of Thornhill near the Nith's confluence with the Carron Water - over which the Bridge is. It was important enough to have a railway station. Not shown on the Roy Lowlands map of 1752, which only shows Morton Mill at the confluence itself. There is no bridge over the Nith until Drumlanrig Bridge another 2 miles to the north, but the ford by the ruins of Tibbers Castle, giving more direct access to the pink palace, Drumlanrig Castle, is still marked on modern maps. The Castle is the seat of the Dukes of Buccleuch and Queensberry, the largest private landowners in the UK. (Buccleuch is near Hawick; Queensberry a 697m peak in the Lowther Hills, just north of the Forest of Ae). They used to have a cycle museum, Undiscovered Scotland still has a page about it, but this has closed - there is a bike shop - Rik's Bike Shed. Another castle close by is Morton Castle, on the shores of artificial Morton Loch behind Morton Wood just off the road to Durisdeer, possibly built as early as the 1260s, but the Treaty of Berwick in 1357 required the destruction of 13 castles including Morton. It was rebuilt in the mid 1400s; burned in 1588; abandoned in 1714; some repair work has been done since. Though the loch appears to be a handy defence, it was just marshland until the 18th century, when a dam was built. 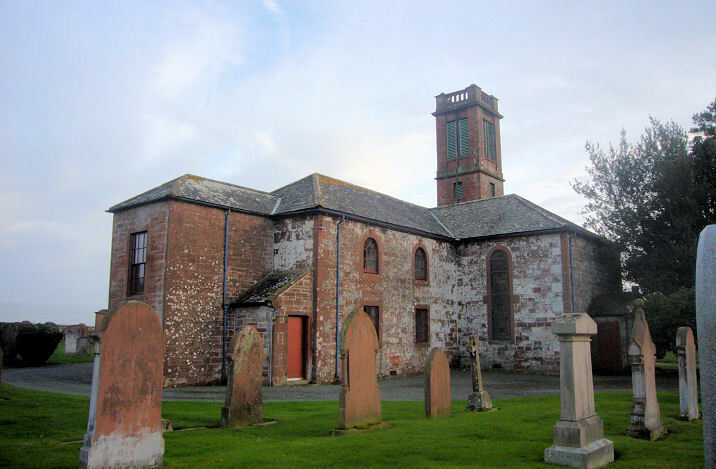 Durisdeer (Gaelic "dubhros" - "dark wood" or "dorus" - "entrance" and "doire" - "(oak) copse or forest") now lies at the end of two roads, but the size of its (parish) church, built in 1699, speaks to its former importance from at least Roman times when they built a road through to Clydesdale using the pass north of Durisdeer to the Potrail Water (a source water of the Clyde). A Roman fortlet has been found a mile north of Durisdeer. 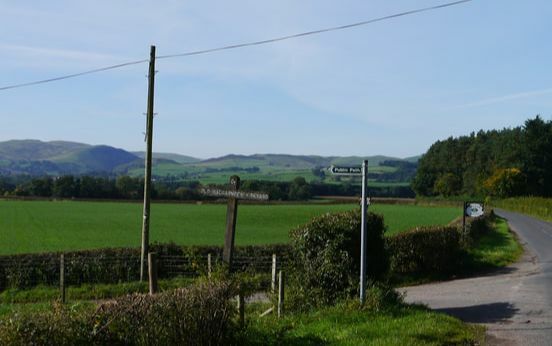 This road was still used as a medieval pilgrimage route (from Edinburgh to Whithorn) known as the Well Path, and a rough track still exists today. The route rises steeply to around 410m, while the modern road (A702) meanders through the Dalveen Pass to a maximum height of 345m. 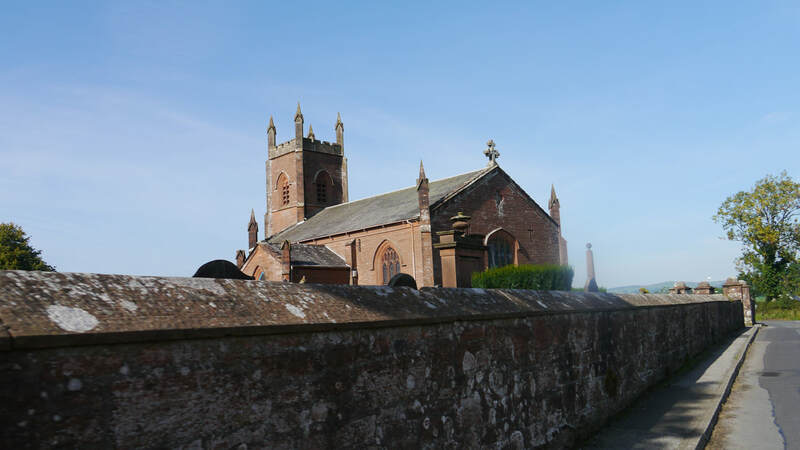 Another reason for the size of Durisdeer's church is that the parish includes Drumlanrig Castle. It is thought stone from the former Durisdeer Castle, in what is now Oldtown Wood just north of the village may have been used in the building of the church. Closeburn (Gaelic - "cill Osbairn" - "church of St Osborne" or Norse - "Asenbjõrn" - "bear of the gods") is 2.5 miles south of Thornhill. Closeburn Castle, a tower house from at least the 14th century, and has been renovated a few times and is now available for holiday rental. Gatelawbridge (formerly Gatelybridge) 2 miles north of Closeburn on Cample Water once had a mineral railway connected to its sandstone quarries. 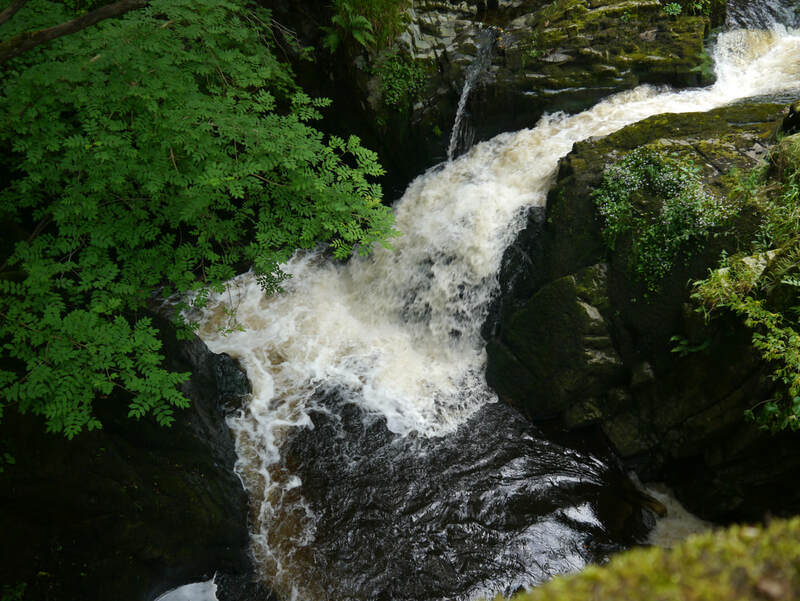 Crichope Linn flows into Cample Water south of Gatelawbridge having carved out a gorge and dramatic waterfalls. Dalswinton (Gaelic "dal" - "plain" or "water meadow"; Old English - "swin-tun" - "pig farm") is a small village on the east bank of the Nith, its story is entangled with that of Patrick Miller who purchased the Dalswinton Estate in 1785 - a friend of Robert Burns, he rented Ellisland to Burns. He developed the rundown Dalswinton Estate, and creating a Loch and building a mansion house on the ruins of an old Comyn stronghold. He was also involved in an ultimately unsuccessful project with William Symington from nearby Wanlockhead to build a steam powered boat. ​Duncow (previously "Duncol" Gaelic "dùn-cholll" or Cumbric "dīn coll" both meaning "fort of hazels") was the focal point of the Kikrmahoe Parish, built around Duncow House, once owned by Leith wine and spirit merchant ﻿﻿John Crabbie﻿﻿. It was just off the main road on the east of the Nith - which was the main road along Nithsdale from Roman times until the 17th century. Duncow House was demolished in the 1960s, and by the time of the Third Statistical Account of Scotland (1962 for Dumfriesshire) only 5 houses were left of the former village. Penpont (Cumbric - "bridge-head" or "hill of the bridge") is 2 miles west of Thornhill on the Penpont Burn and Scaur Water, and not far from confluence with Shinnel Water. Tynron Doon fort lies a couple of miles further west, and was a natural fortification, enhanced with ramparts and ditches, in use for over 1000 years and visible 'for miles around'. The Volunteer Arms in Penpont closed in 2011, villagers have been running a campaign since, called Penpont Needs a Pub. Local info on village website Penpont Matters. Courthill Smithy, near Keir Mill, a mile down the road, from Penpont is where Kirkpatrick MacMillan who invented the bicycle in 1841, lived - a plaque on the building commemorates him; his grave is in the graveyard of the old Church off the Keir Bridge (Mortonholm) road is now signposted within the village. Moniaive (Gaelic - "Am Moine Naomh" - "The Holy Moor"; or "moine ghàbaidh" - "dangerous moss" according to some sources - or "monadh-abh" - "hill of streams") - according to the village website). 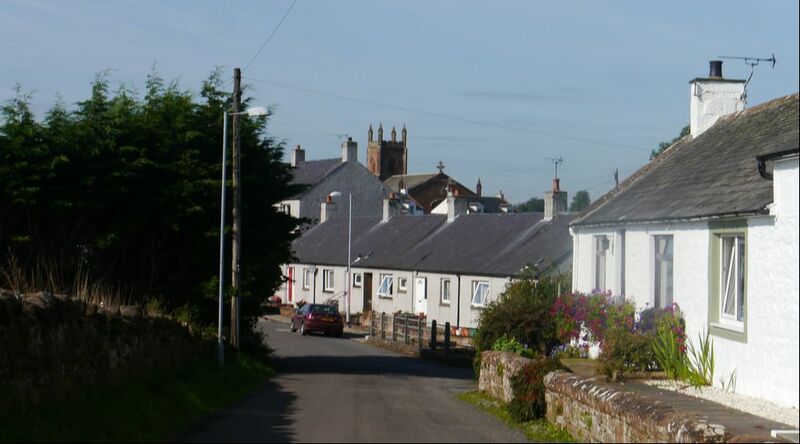 Moniaive existed as early as the 10th century - it was granted a charter as a free Burgh of Barony in 1636. The Cairn Valley Light Railway was built to Moniaive in 1905, it was hoped that it could be made into a resort, but that didn't happen and the railway was never a commercial success - it was closed as a wartime economy measure in 1943, some goods traffic remained until 1947, but it never re-opened. 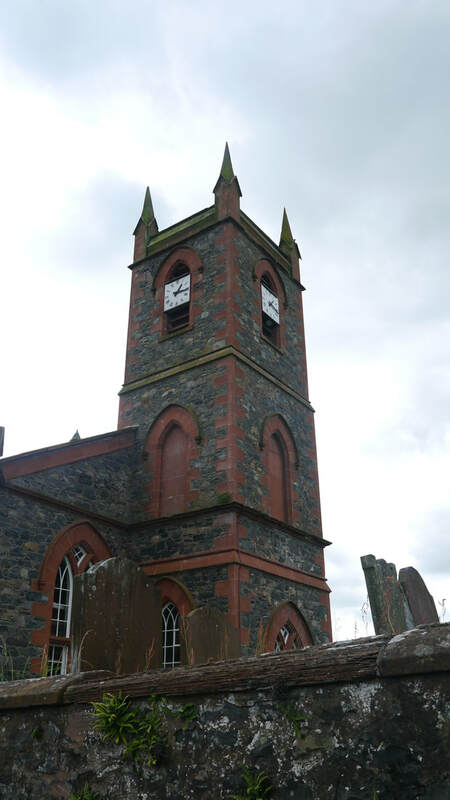 The last Covenanter 'martyr' James Renwick was born in Moniaive, he was hanged in 1688 for refusing to swear fealty to King James VII (James II), there is a monument to him just outside the town. The Cairn Valley Light Railway had a station called Dunscore though it was about 1km from the village on the other side of the Cairn Water. Dunscore village was previously known as Cottack, but the parish has always been known as Dunscore (though spelling has changed over the years eg Dunskoir). It is a strange shape, as shown on the 1832 map, narrowing to a few hundred yards near Milton and stretching as far as Loch Urr. 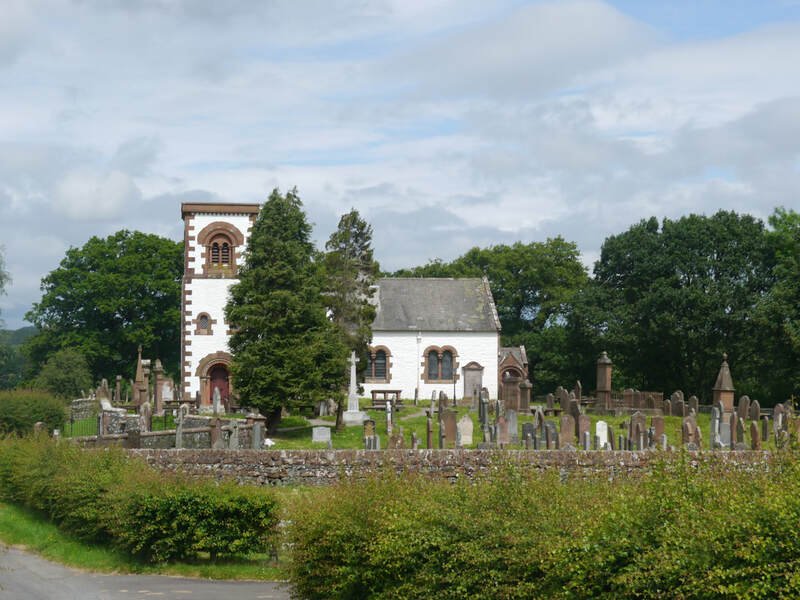 The original Dunscore parish church was established near Gateside of Isle in 1172, which explains why there's a graveyard there - including the tombs of Robert Burns' friend Robert Riddell, and the 'Cruel Lag' (see Auldgirth below), near Isle Tower in the far east of the parish. The move to the current site in the 1650s occured when the previous building was found to be ruinous - the old and new sites linked by Coldside Road (not shown on the 1832 map) and the Laggan Burn which is given considerable prominence in this Blaeu map from 1654. The present church was built in 1823 when its predecessor was also ruinous. 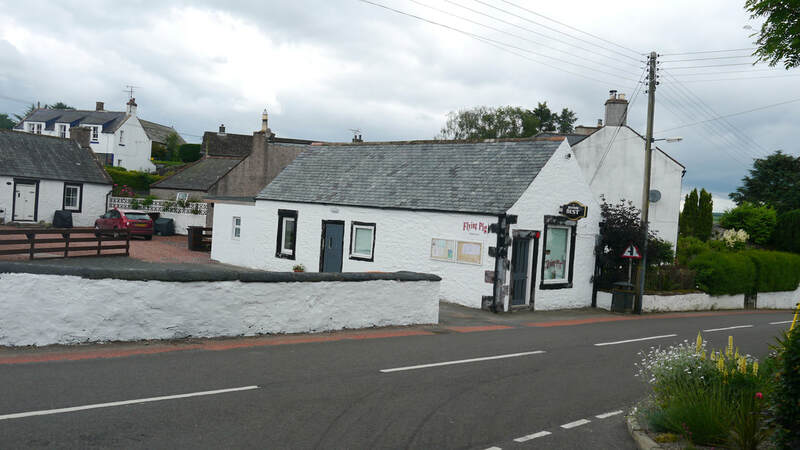 The Flying Pig pub in Dunscore was taken over by the community when it was threatened with closure. 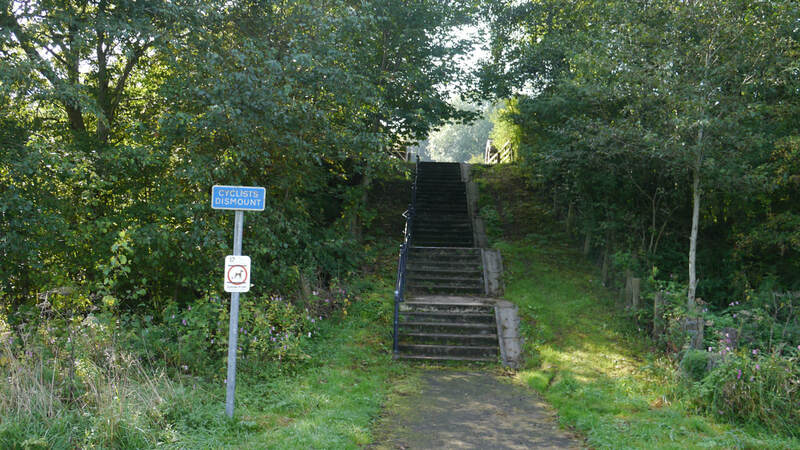 Irongray (Believed to be a corruption of Gaelic "àird an greaich" - "height of the moor") has a bridge over the Cluden Water, and a Parish Church, it also had a station on the short-lived Cairn Valley Light Railway. ​It's a rural area with 505 people according to the Community website - that's the population of the Kirkpatrick-Irongray parish. The main river of the parish is Old Water - the Cluden/Cairn Water forms the northern boundary, and is also the boundary between the old counties of Kirkcudbrightshire and Dumfriesshire. It flows down from Glenkiln Reservoir, built in 1934, past the largest settlement of Shawhead. Just prior to its confluence with Cairn Water, is the much repaired ﻿Routin Bridge﻿ - probably originally built in the 17th century - under which there is a photogenic waterfall. Other than that, there's not much - there used to be a Sculpture Park in Glen Burn, with pieces by Henry Moore, Epstein and Rodin, but after one got stolen all but one of the others have been removed. Only the Glenkiln Cross remains. Auldgirth (Gaelic "allt" - "stream" and "girth" - "sanctified circle" or "garth" - "garden"; or Middle English "ald girth" - "old enclosure") is where the A76 crosses the River Nith - the road did so long before it was the A76, the old bridge was built in 1782 - until then the Roman road had been on the east bank of the Nith, and there was a road of sorts on the west. The old bridge was replaced in 1979, and now Auldgirth is off the main road. the old bridge can still be crossed, but the roads that approached it from the west have been removed - and replaced by...steps - and a helpful Cyclist Dismount sign. Auldgirth had a railway station until 1849 to 1952. Lag Tower is through Glenmidge at the end of a steep sided glen - abandoned in the time of its most notorious resident, Robert Grierson, known as the Cruel Lag and awarded a Baronetage of Nova Scotia for his part in the repression of Covenanters. The baronetages were awarded, for 3000 marks, to help the plantation of the new colony. Clan Grierson have established a Lag Tower Preservation Trust. Ellisland Farm, where Robert Burns lived from 1788-1791 in a last ditch attempt to make a successful living as a farmer, is two miles south of Auldgirth, now open to the public. Nearby is Friars Carse, now an hotel, but in Burns' time the house of a friend, Robert Riddell, Burns used a folly on the Estate known as the Hermitage to write. Holywood (Latin "sacrum nemus" - "holy wood") also had a station on the Dumfries to Glasgow railway from 1849 to 1949, though originally named Killylung. The loch on the road to the station is called Zuider Zee, I've not been able to find out why, but it has been known to host curling! Holywood had an Abbey from 1141 (or 1225?) until dissolved in 1609. It was also known as Dercongal Abbey (Gaelic "doire" - "(oak) copse" - Congall's oak copse; there were a number of Irish saints of this name). It was demolished in 1778 and the remains used to build the Parish Church. There are a couple of local Tower Houses, one named Isle Tower is believed to have been built in around 1589, and was on an Island in the Nith at the time, an 18th century house was added, and it is now the HQ of Leslie & Baggott. Neighbouring this is the Garden of Cosmic Speculation, a sculpture garden in the grounds of Portrack House, owned by Charles Jencks, also responsible for the design of the Crawick Multiverse near Sanquhar. The other Tower House is Cowhill Tower - the replica Tower appears to have been built in 1914, and the house alongside in 1816, but there are remains of the 1579 structure referred to in the Canmore link. Thornhill sits roughly midway between Dumfries and Sanquhar - the largest settlement between the two, but its railway station has been closed since 1965. Next to the former station, the old Auction Mart also looks derelict. 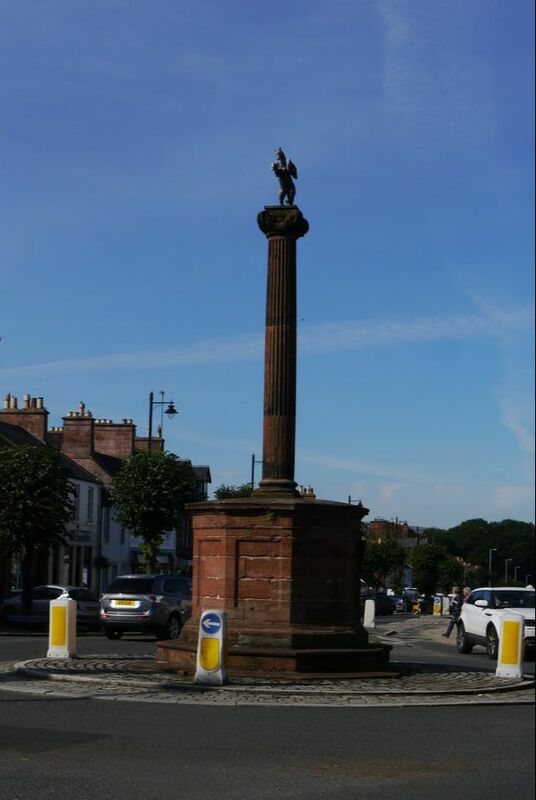 The Nith Bridge Cross stands by the Nith Bridge, and dates to the late 800s or early 900s. 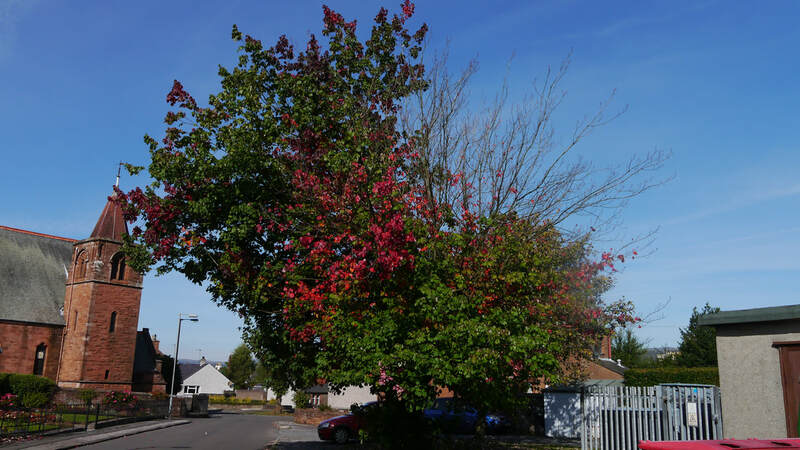 Though there has been a settlement at Thornhill as early as 1369, the main town in the area was Dalgarnock (aka Dalgarno, or simply the auld toun). Dalgarnock was located between modern day Thornhill and Closeburn, by Kirkbog and Kirkland, south of Cample Water. 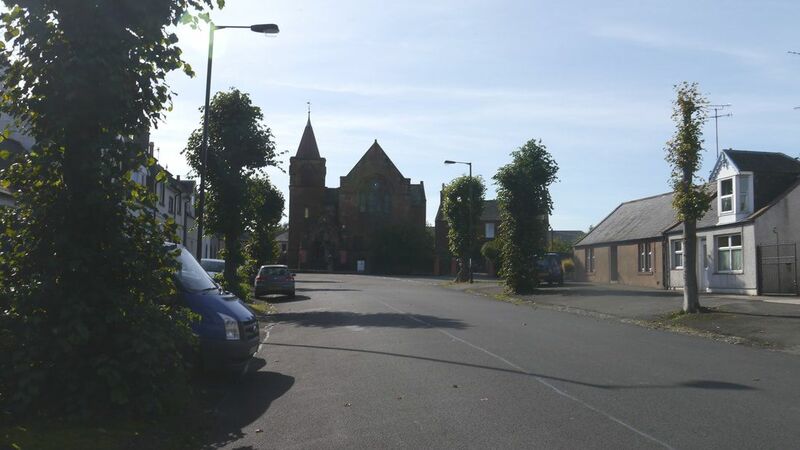 No houses remained in Dalgarnock by the 1790s, with only the churchyard still around today. 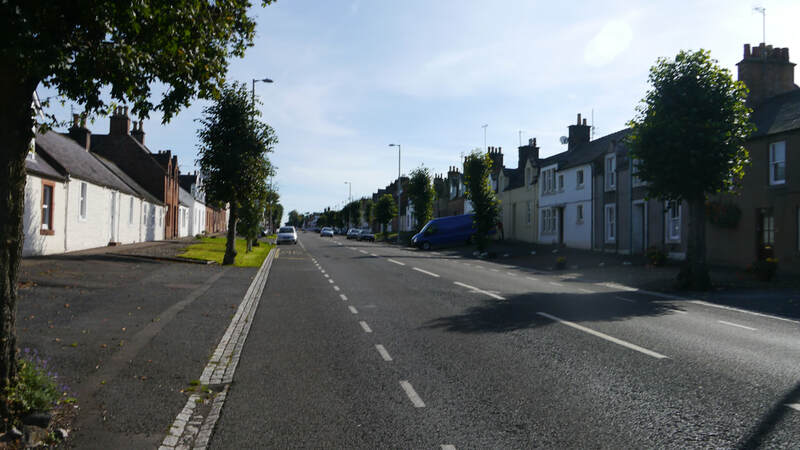 Thornhill was initially named New Dalgarnock (or Nue Dalgarno) and was planned out along its two perpendicular broad streets by the Earl of Queensberry when it was formally established from 1714. The new road from Dumfries to Glasgow was built in 1715, a little to the east of the former road, it is now the A76, in Thornhill, Drumlanrig Street, named for the nearby castle. It is crossed by Morton Street, named for the parish, at the Mercat Cross which now forms a small roundabout. The map from around 1900 shows a Brewery by the Nith Bridge, but there is no trace of this in later maps. Rabbie Burns lived for some time at Ellisland Farm a few miles south, and is reputed to have visited Thornhill many times, but he only mentions its older predecessor, Dalgarnock, in his poems. Nearest Stations: Sanquhar (SQH) (13 miles) has ramped access to Platform 1 and 2 from St Mary's Street, Platform 1 also has level access from Station Road. Irregular trains to Glasgow & Kilmarnock, and Carlisle - some of which go on to Newcastle. There are unacceptably lengthy gaps in the timetable. On Sundays the service is frankly disgraceful only 2 trains each way - the first to Glasgow at 1417 and to Carlisle not until 1630! Live train times. 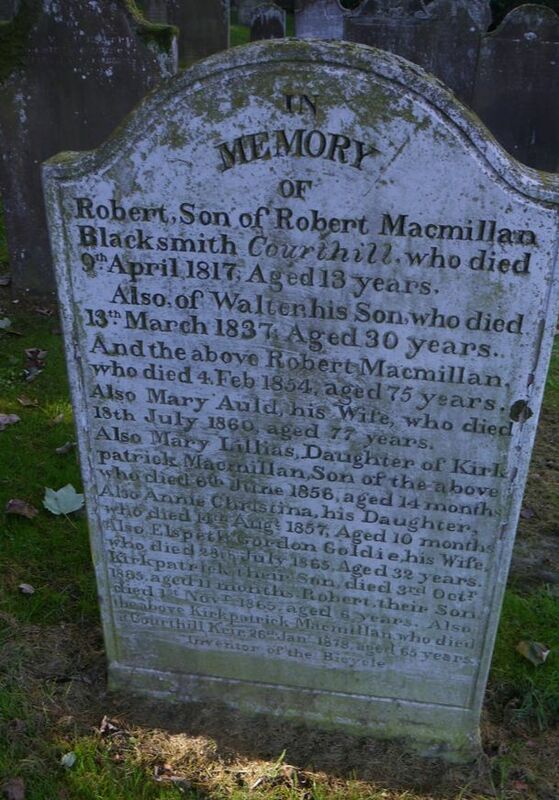 Gravestone of Kirkpatrick MacMillan, Keir Mill. His name is right at the bottom.